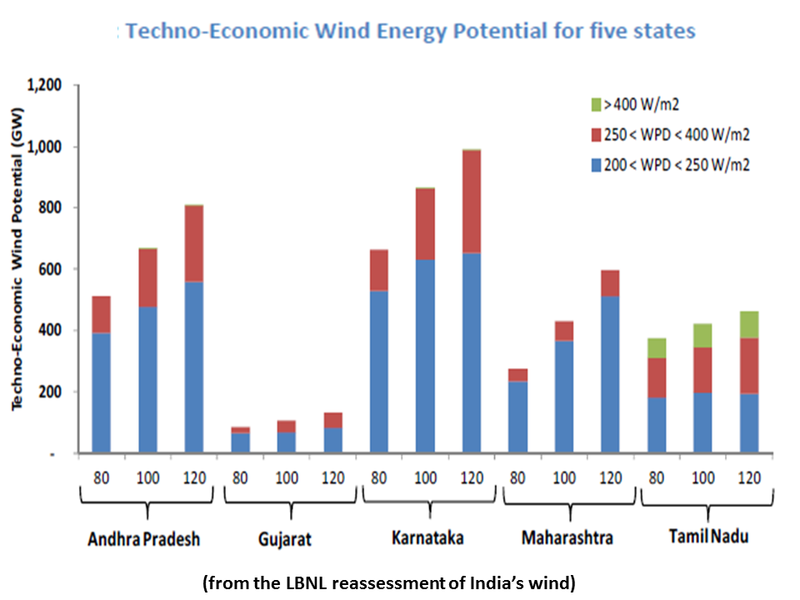 We assess the techno-economic on-shore wind potential in India at three hub-heights – 80m, 100m, and 120m. Assuming a turbine density of 9 MW/km2, the total wind potential in India with a minimum capacity factor of 20 percent ranges from 2,006 GW at 80m hub-height to 3,121 GW at 120m hub-height. This techno-economic potential excludes the potential on lands that are difficult to use for wind power development such as low quality wind areas (wind power density < 200 W/m2), areas with slopes greater than 20 degrees, areas with elevation greater than 1,500m, forests, snow-covered areas, water bodies, urban areas, and protected areas. 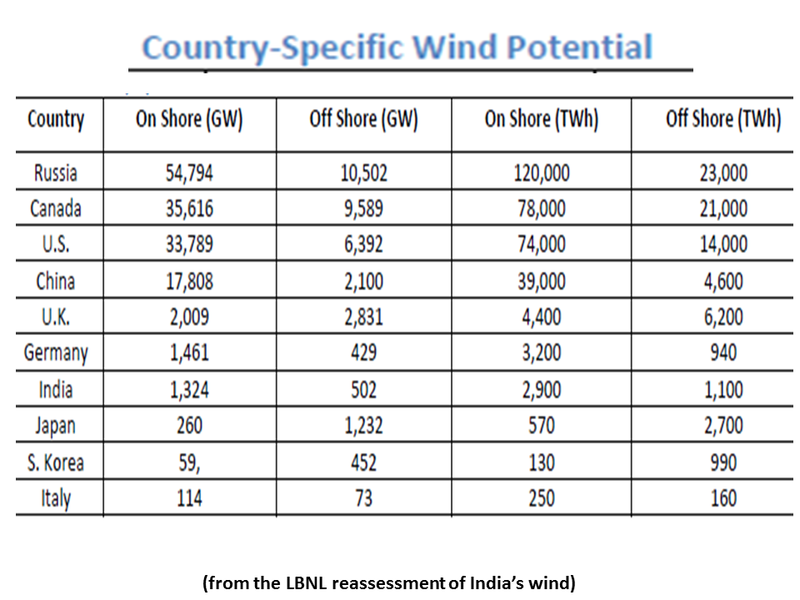 These estimates are approximately 20 times the current official estimate of wind energy potential in India (estimated at 80m hub height). The total land footprint of developing 543 GW of this wind potential (with capacity factor > 25% at 80m) is likely to be approximately, 1,629 km2 or 0.05% of the total land area in India since, typically, only 3% of the land required for wind power development is its footprint on the ground and the rest of the land can be used for other purposes. 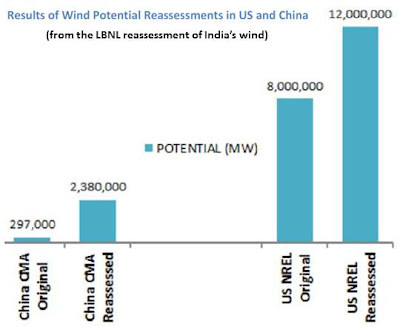 Wind potential estimates in India need to be reassessed for three reasons. 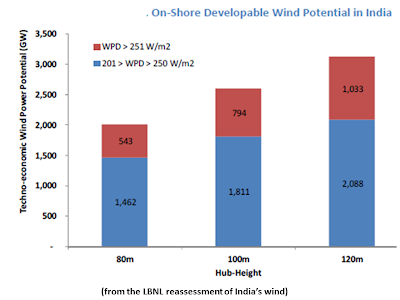 First, two recent studies – one conducted by experts from Harvard University and the Technical Research Center of Finland (published in the Proceedings of the National Academy of Sciences) and the other by experts from The Energy Resources Institute (India) – estimate on-shore wind potential in India to be >1,000 GW (estimated at hub-heights >= 80m).1 In sharp contrast, the official wind energy potential estimate (by the Center for Wind Energy Technologies (CWET), India) used by the Indian government in its policy-making process is only 103 GW (estimated at a hub height of 80m).2 Second, recent reassessments conducted in various countries such as the U.S. and China have found much higher wind energy potential due to better technology in the form of higher efficiency, hub heights, and sizes of wind turbines. The official wind potential estimates (expressed in capacity terms) used by China have recently increased by 800% and those of the U.S. by 50% (see Figure ES 1). Wind potential estimates for the US expressed in terms of energy have increased almost 400%. Third, systematic analysis based on Geographic Information System (GIS) data provides an accurate way to identify land with wind power development potential. 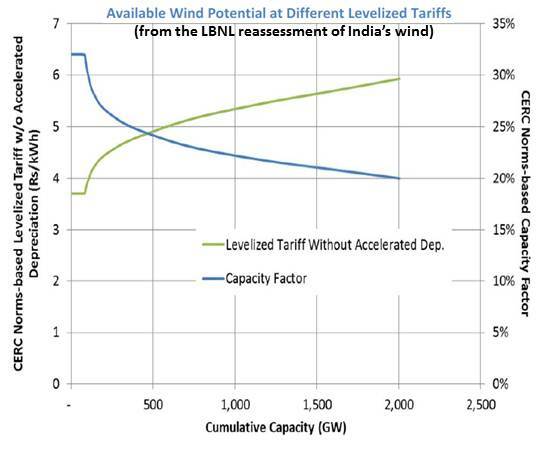 The potential estimate by CWET presented in the 2010 Indian Wind Atlas, arbitrarily, assumes that just two percent of the windy land is available for wind energy development. 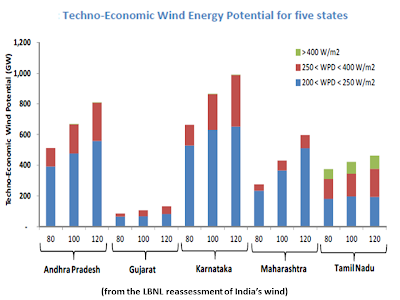 All three reasons taken together suggest that a transparent and systematic reassessment of the wind resource in India could also reveal a substantially higher potential than previously estimated and could potentially have major implications of Indian power sector policy. In this study, wind energy potential for turbines at 80m, 100m, and 120m hub-heights was estimated at varying levels of capacity utilization factors. The hub-height of the most commonly sold wind turbines today is 80m.3 In general, the trend is toward steadily increasing hub-heights, with most major wind turbine manufacturers now offering turbines with hub-heights >100m and some as high as 150m. Annual average wind power density (WPD) and wind speed data at an elevation of 80m, 100m, and 120m for each 5 km by 5 km cell in India was procured from 3Tier.4 Publicly available GIS data on topography and land use and cover (LULC) was used to exclude areas where development of wind facilities would be technically and economically unviable. The excluded sites included low quality wind areas (WPD < 200 W/m2), areas with slopes greater than 20 degrees, elevation greater than 1,500m, forests, snow-covered areas, water bodies, urban areas, and protected areas. As observed in locations around the world, land can be used simultaneously for wind energy production and for agriculture (for example, farming, cattle-raising, etc.). Hence, wind energy potential estimates are transparently presented by LULC type without applying any subjective criteria for development. Assuming a turbine density of 9 MW/km2, Figure ES 2 shows the techno-economically viable on-shore wind potential at three different hub-heights. The total wind potential in India with a minimum capacity factor of 20 percent ranges from 2,006 GW at 80m hub-height to 3,121 GW at 120m hub-height. 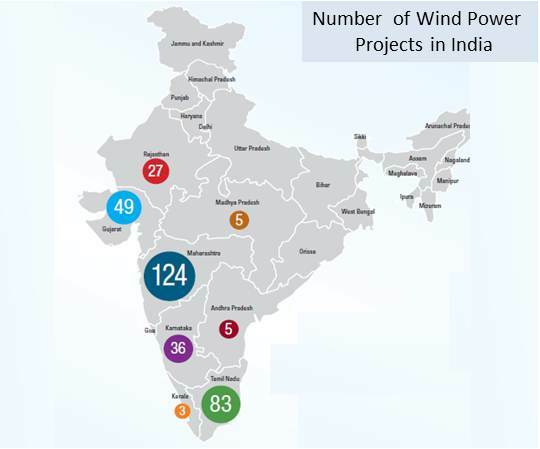 More than 95 percent of the wind energy potential is concentrated in just five states in southern and western India – Tamil Nadu, Andhra Pradesh, Karnataka, Maharashtra, and Gujarat. The state with the overall largest resource is Karnataka while the state with largest best-quality resource is Tamil Nadu. From a cost-effective perspective, the full development of best-quality wind resources in Tamil Nadu – which already leads all states in installed wind capacity – would yield a capacity of 65 GW at 80m hub-height and a minimum capacity factor of 32%. This is more than four times the total installed wind capacity in India. It is unlikely that all of the wind potential identified will be developed. The land requirement for developing 543 GW (with WPD > 250 W/m2 and CF > 25%) will be about 60,362 km2 (based on a turbine density of 9 MW/km2), about 2% of the total land area of India. Out of this land requirement, only a small percentage (typically about 3%) is disturbed permanently, primarily due to towers and roads, and the rest of the land can be used for other purposes. For example, based on the study of 93 wind farms totaling 13,897 MW in the US, Denholm, P. et al. (2009) found that the permanently impacted land due to wind power development is about 0.3 Hectare/MW. Hence, the actual land footprint of developing 543 GW of wind power is likely to be approximately 1,629 km2, about 40 km by 40 km area, or 0.05% of the total land area of India. 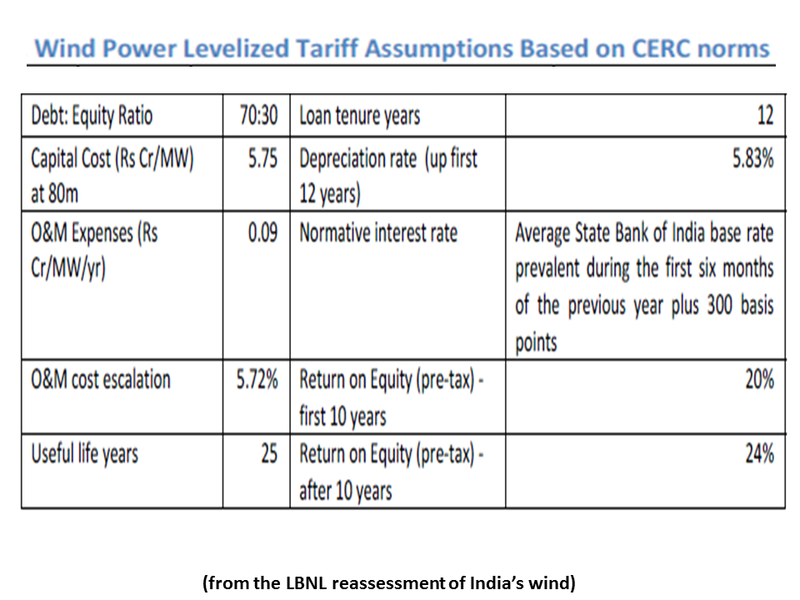 Using the norms specified by the Central Electricity Regulatory Commission (CERC), Figure ES 3 shows the estimated wind potential at various levels of levelized tariffs. 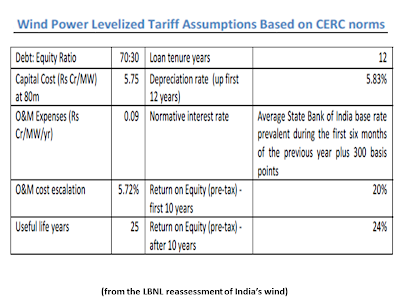 Based on CERC norms, approximately 200 GW of wind potential is available at a levelized tariff of Rs. 4.5/kWh or less and about 100 GW is available at Rs 4.0/kWh or less at all three hub-heights. 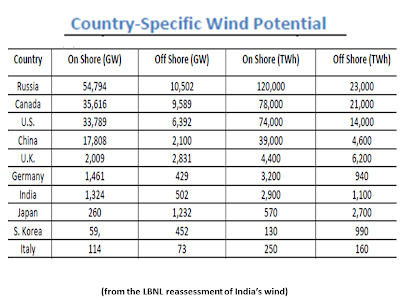 It is necessary to note that the estimates presented here regarding yields and the extent of land most suitable for wind power development in India are not detailed enough to determine sites for an actual wind generation facility or predict its exact output. These estimates are, however, appropriate for use in high-level policy-making; estimates based on methodologies similar to the one used here serve as the basis for policy development and long-term power sector planning purposes in the U.S., China, and the European Union. Our findings suggest that the availability of a developable wind resource is not a constraint for wind to play a major role in India’s electricity future. This is in sharp contrast with the earlier official estimate of the potential, which, if fully exploited would have provided only about eight percent of electricity demand (in energy terms) in 2022. The technical feasibility of integrating large quantities of wind energy needs to be assessed systematically. However, experience from operation of existing power systems in such places as Denmark and Germany and several studies, have indicated the techno-economic feasibility of such integration (Milligan et al., 2009 and Wiser et al., 2011). Given effective planning, policies, and programs, wind energy can be a core component of India’s affordable, reliable, and clean energy portfolio. - The techno-economic on-shore wind potential ranges from 2,006 GW at 80m hub-height to 3,121 GW at 120m hub-height with a minimum capacity factor of 20 percent. More than 95 percent of the nation's wind energy potential is concentrated in five states in southern and western India – Tamil Nadu, Andhra Pradesh, Karnataka, Maharashtra, and Gujarat. The state with the overall largest resource is Karnataka while the state with largest best quality resource is Tamil Nadu. Under the CERC norms, approximately 500 GW of wind potential is available at a levelized cost of Rs. 5/kWh or less – at 80m hub-height. At least 100 GW of wind energy potential can be developed today at less than Rs. 4/kWh at 80m hub-height. 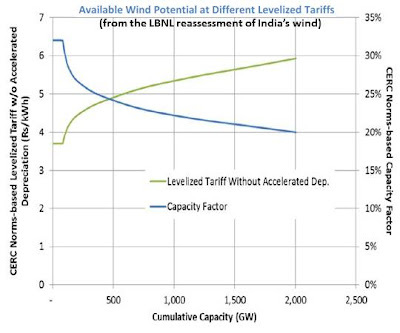 Considering the findings of the large wind potential, it is possible to imagine scenarios where wind energy can play a substantial role in India’s energy mix and contribute significantly to reduction in power shortages in the short term and energy security and environmental sustainability in the long term. These promising results provide sufficient support for conducting further analysis (on topics such as wind integration, transmission planning, regional coordination, cost effective development, and land policies) and dialogue that would ensure that this large, cheap, and clean resource available in India is developed as quickly and as cost effectively as possible.